← Tree tour show and tell. Wanna share? Preparing for the new year. I’m slowing making my way through cleaning up in the basement. We’ve been purging things for a while, my son has been very excited to “share” his toys with other kids who can use them. I’ve taken things into my school for classrooms, to the consignment store and off to donate. I’m doing everything to avoid making garbage. The other day I spent a load of time sorting my scrapbin. Since I’ve changed my cup cozy design a bit there were some pieces previously too small that will now work. Usually I make pin cushions but I’m getting a little tired of that. I’m going to make some of these pouches, with Wesley’s help, for some of the important women in his life. I also want to make a cover for my bodem so I’ll quilt the little pieces into a larger piece of fabric to make that. Plus I really want to try Keyka Lou’s technique. So I cut what I could into 2 X 2 inch squares. Not entirelly sure what I’ll make with them yet but I’ll figure something out, or ideas are welcome! This entry was posted in repurposing, sewing and tagged organizing, quilting, repurposing, scrapbusting, scraps, sewing. Bookmark the permalink. 2 Responses to Preparing for the new year. I have tried to do that in the past, take my odd size scraps and make them into standard shaped squares and rectangles. I do quilt, so there are tons of scrappy quilt patterns that will use the squares. 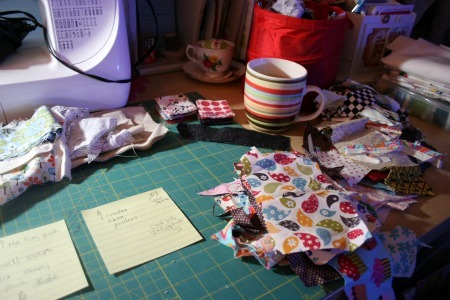 It seesm every time you clean out a box and make squares, the scraps multiply and there’s more to do! I still have TONS of scraps to organize .. I’m so glad you are making progress, and I hope to start again .. I’ve beent aking a break, but 2011 may be my year to accomplish some things! 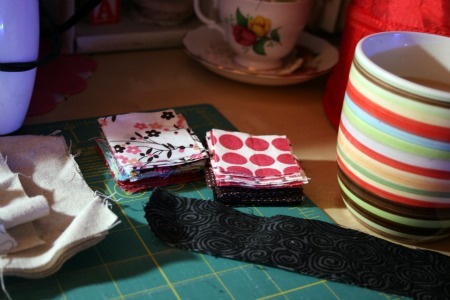 Pingback: Sew Tara » Blog Archive » Scrap Swap anyone?